We always said that this plan and route needs to be fluid and will be subject to change. Well it’s changing at a rapid rate of knots, and can change without hardly any notice. Take proposed border crossings as an example. This week, Mauritania closed it’s border with the troubled country of Mali, due to a 2 year old girl from neighbouring Guinea contracting Ebola, and sadly later dying. At the time of writing no other cases have been reported from Mali. Our plan was to enter South Eastern Mali from Mauritania, to avoid the countries hardest hit by the Ebola Virus, hopefully the situation will improve by the time we get to the area. So far the borders between Mauritania and Senegal and Senegal to Mali remain open, so that’s still an option. Even more worrying is the border between Nigeria and Cameroon, this has been closed due to the security problems caused by the Islamist group Boko Haram, which are based in Western Nigeria, but have been crossing the border into Cameroon and raiding villages. Again, hopefully by the time we get there this situation will be eased and the border will be open. Apparently talks are taking place between the Islamists and the Nigerian Government in neighbouring Niger at the moment. Below is a map showing current border issues: click on it to enlarge. 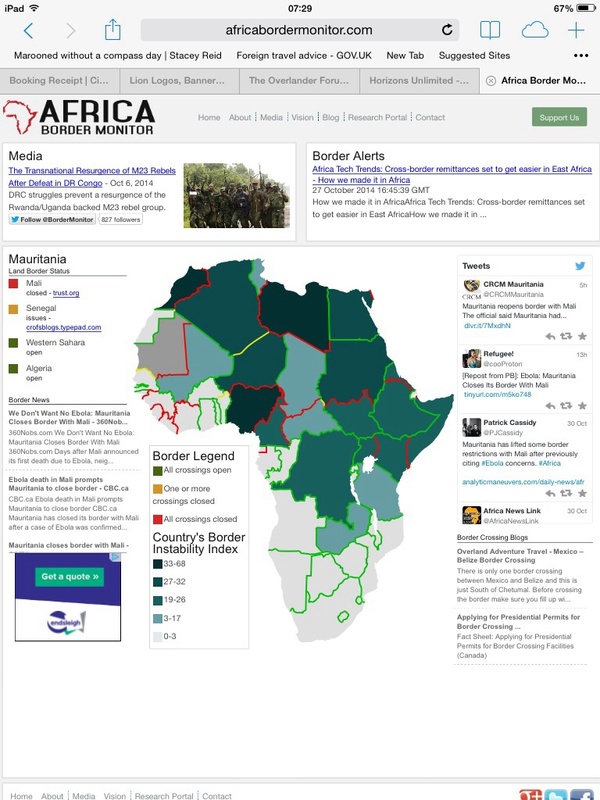 The options of avoiding the Nigeria/Cameroon border are much more dangerous and would involve crossing into Chad, Niger, Sudan, and Ethiopia, Niger and Chad have their own security problems, and are not really suitable for overland travel at the moment. There is also the option of sea travel on a roll on roll off ship from Dakar in Senegal to Walvis Bay in Namibia. This is not what we want to do and it is hellishly expensive, to put the truck on the ship, and a complete nightmare paper work wise. It would also means that we would have to fly to Namibia. So we just have to remain flexible with our plans. It could all change again next week. Of course it will, this is Africa after all! I was rather hoping to drive down to Tanzania to see a friend then on to South Africa but there’s no sane route through North Africa I can see. All the Foreign Office information is do not travel to pretty much every country between Morocco and Tanzania, if not Ebola then terrorism. Some particularly nasty terrorists too, the kind who know there’s a fair old trade to be had ransoming westerners. I came across a guy who shipped his vehicle to South Africa but I don’t know how much it cost. I shall investigate further, though I imagine it would be more expensive than a vehicle which could be put in a container. The Foreign Office website is and always has been extremely cautious, and whilst many places in Africa are very difficult, there are still many Europeans travelling down the West route. Ebola is mostly only effecting 3 small West African counties, and it’s fairly easy to skirt around these as long as neibouring countries keep their borders open. Islamic terrorism is obviously a concern, but again there are hot spots to avoid such as Eastern Mali, Northern Nigeria, Algeria and Somalia. All of these are fairly easy to avoid. Eastern DRC is quite lawless, but then again so is the outskirts of Jo’burg! If you look at the regional forums for Africa on The HUBB website (mostly motorcycles), you will see that there are still a number of people travelling down through the Dark Continent, some on their own. The biggest problem at the moment is border closure between Nigeria and Cameroon. But I’m sure for economic reasons this situation can’t remain for long.